The 2013 regional conference was attended by 300 participants from governments, Members of Parliament, academia, civil society and youth organizations. Official delegations from 43 UNECE countries were present. 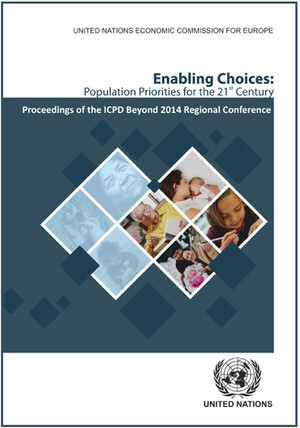 The conference endorsed the Regional Report and advanced the discussion on the population and development agenda beyond 2014 based on the findings and recommendations from the three thematic meetings held in preparation for it: Population dynamics and sustainable development; Families and sexual and reproductive health over the life course; and Inequalities, social Inclusion and rights. A major outcome of the conference, as attested by the Chair’s summary, is the affirmed commitment of countries in the UNECE region to further support the main objectives of the ICPD Programme of Action. The proceedings aim to diffuse the richness of the discussion at the conference and its outcomes to a wide audience and to enhance awareness on crucial issues, such as gender equality and empowerment of women, sexual and reproductive health and rights, population ageing and migration, environment and development, and participation in civil society.